Heatsavr is a transparent liquid pool cover that forms a barrier on the surface of the swimming pool which inhibits evaporation and reduces heat loss. Energy savings up to 40% can be realized. Used with indoor pools, you will see a reduction in evaporation and humidity, thus lowering the cost of air conditioning and maintenance. Commercial pools require 1 oz of Heatsaver per 400 sq. ft. of pool surface area daily. Heatsavr can be applied manually or through the use of the Automatic Metering System. NOTE: Only available in the United States. Ships via FedEx Ground. Signature upon delivery is required. Ensure you provide a valid phone number upon checkout for fastest delivery. Click Here to view the Heatsavr MSDS sheet (PDF). Manual application is time consuming, potentially complicated and requires one or more people. Requires a considerable amount of space for storage and rollers. Automatic, hands-free easy application that requires absolutely no storage and no labor to apply. Savings of 50-70% can be achieved but only when the cover is correctly covering the pool! There can be no savings if the cover is not in use. It is very difficult to find a traditional pool cover to protect your uniquely shaped pool, and impossible to cover around fountains and/or waterfalls. Savings of up to 45% can be achieved 24 hours a day, 7 days a week. You will be fully covered, even when the pool is in use! A liquid solar pool cover forms itself to any shape you can create, and even works around your fountains and waterfalls. Even a high quality plastic pool blanket diminishes the beauty of your yard, whether it is covering your pool or rolled up beside it. The liquid cover is entirely transparent and allows your pool to look its natural best all day, every day. While a pool cover is in use, there is always a risk that a child or beloved pet will become trapped underneath the cover. While a cover is being removed or is in storage, there is a risk of injury or entanglement. Heatsavr™ and Ecosavr™ are safe for all pool users. Pool owners and operators can relax, knowing that their pool is safely covered at all times. A plastic pool blanket can cost hundreds of dollars for the blanket alone, with extra costs mounting for unique design, automation and storage equipment. Heatsavr™ and Ecosavr™ have a proven 6:1 rate of return and, for an average backyard pool, usually costs only $10-12 a month, with no extra or hidden costs! SRP is two entities: the Salt River Project Agricultural Improvement and Power District, a political subdivision of the state of Arizona; and the Salt River Valley Water Users' Association, a private corporation. The District provides electricity to nearly 934,000 retail customers in the Phoenix area. It operates or participates in 11 major power plants and numerous other generating stations, including thermal, nuclear, natural gas and hydroelectric sources. Pool water fact: With more than 300,000 pools in Arizona, the water lost to evaporation each year is significant. The average pool contains 10,000 to 15,000 gallons of water and evaporates its entire contents each year. Today technological advances allow you to add a liquid to your pool to reduce evaporation. SRP has tested two different types of liquid pool covers: one that is silicon-based and one that is isopropyl alcohol-based. Both liquids form a safe, extremely thin layer of molecules on the surface of the water that reduces evaporation by 30 to 50%. Additionally, if you heat your pool, using a liquid pool cover will reduce both heat loss and energy consumption. Cost: Liquid pool covers can be added to your pool for about $2.50 to $3.50 per week depending on the size of your pool's surface area and how frequently you add the product. "I have noticed less moisture on our windows in our pool areas when the pool is uncovered... Heatsavr will pay for itself in no time with the savings on water and gas alone." - B. Grzelka, Atlanta Swim Academy. Butlins Splash Pool Complex in Bognor Regis, West Sussex, United Kingdom, reduced fuel consumption by 38% and saw a return of 540% from their use of Heatsavr Liquid Pool Blanket. Review the numbers here. What are Heatsavr™ and Ecosavr™ and how do they work? Heatsavr™ is a transparent liquid that spreads across the surface water of your pool to greatly reduce heat loss by inhibiting evaporation. The monomolecular active ingredient creates an invisible barrier over the surface of the water with the aid of Isopropyl Alcohol (IPA) as a spreading agent. IPA evaporates within 25 minutes of applying the product leaving the active ingredient on the water surface to create the solar blanket. The molecules are completely safe for pool users and are biodegradable. Ecosavr™ is a patented fish shaped application method for Heatsavr™, the original liquid solar pool cover. Anyone with a heated pool or spa, especially those without pool blankets. Indoor or outdoor swimming pool owners. Pool or spa operators facing high energy and water costs. Those with large or odd shaped pools that cannot use conventional pool covers like universities, apartments and condominiums, municipalities, fitness clubs, and schools. Anyone with a swimming pool that looses temperature over night or in dry areas where evaporation is a problem. Operators that have a difficult time removing and replacing their pool cover. Why should you use Heatsavr™? To save money on the energy and water expenses encountered when operating a pool. To keep the heat in the pool and avoid climatic temperature drops. To decrease the cost of refilling a pool due to evaporation and chemical readjustment. As an alternative to plastic pool blankets, Heatsavr™ is easy to apply and once installed is a hands-off application. When should you use Heatsavr™? When the temperature of your pool drops at night. When your pool or spa is evaporating. How effective is Heatsavr™ compared to a plastic pool blanket? Based on a 24 hour a days, 7 days a week comparison, Heatsavr™ is about 75% as effective as a plastic pool blanket. However, it is important to remember that Heatsavr™ is protecting your pool 100% of the time, even while you are swimming, whereas a plastic blanket is only effective when it is properly secured and perfectly fitted to your pool. As such, most of our customers find that their swimming pools are warmer and their energy bills are lower when using Heatsavr™ than they were with a plastic cover. You must also remember that Heatsavr™ is a hands-free, once a month application, as opposed to the complicated daily task of removing and replacing a pool cover. How can I measure energy savings? When trying to measure energy savings, it is recommended that your pool be treated like and experiment using only accurate and specific data. For instance, if a pool is trying to measure from their energy bill they will need to take into account everything that uses heat energy at the facility such as hot water for a kitchen and showers or energy used to heat the building. Each facility is different and needs to be analyzed individually. Often an energy consultant is involved to ensure accurate data. How do you use Heatsavr™? Disperse one ounce of Heatsavr™ per 400 square feet of pool surface area daily, either by directly pouring into the pool, the use of our automatic metering system (add a link to the metering system) or the once a month, pre-measured, slow release fish, Ecosavr™. (link to ecosavr) To calculate the surface area of your pool, simply multiply the length by the width in feet. Can people swim while Heatsavr™ is in use? Absolutely. Heatsavr™ is tested and proven to be absolutely safe. It is designed to be in use 24 hours per day, which gives Heatsavr™ a distinct advantage over standard pool blankets. If someone swallows pool water that has been treated with Heatsavr™, is it harmful? Is Heatsavr™ safe for the environment? Yes, Heatsavr™ is environmentally friendly and actually biodegrades into safe, simple compounds in approximately 24-48 hours. The savings in energy and water also increase the environmental benefits. Is Heatsavr™ safe for filters and plumbing? Yes, Heatsavr™ is non-corrosive. There is no detrimental effect on pipes, pumps, valves, chlorine controllers, or filters (DE, Sand or Cartridge) commonly used in pool applications. Will Heatsavr™ conflict with my salt water system, chlorine generator or algaecides? 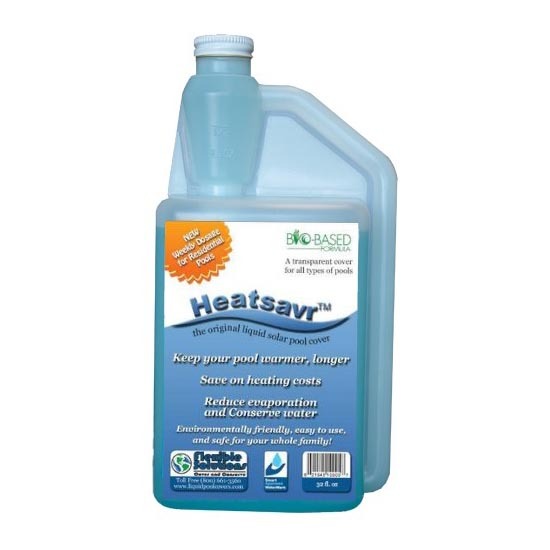 Heatsavr™ has been tested against most known pool chemicals and has no effect on either the chemicals or instrumentation. 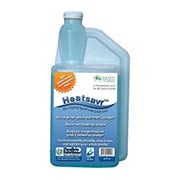 Heatsavr™ is completely compatible with salt water systems. Will my pump or skimmer stop Ecosavr™ from functioning? The liquid inside each Ecosavr™ fish has a natural tendency to reform across your pool surface when the water is disturbed. However, we do recommend that all jets are aimed so as not to break the surface of the water, typically parallel to the surface. This creates a circular flow, which actually helps your skimmer by sending dirt and debris to the center of your pool. To avoid having the Ecosavr™ fish vacuumed by your skimmer, we suggest tying it to your pool steps, or to the back of the skimmer. As most heat is lost at night, it is always a good idea to place your pump on a timer, having it turn off around 10pm and restart in the morning around 7am to maximize your savings. I don't heat my pool; should I still use? Heatsavr™ is especially important for pools which are not heated in order to help increase the temperature of your water and make your pool an enjoyable environment for family and friends. Most heat is lost throughout the evening and gained during the day; Heatsavr™ helps to ensure that all the heat that is gained during the day stays in your pool throughout the night, allowing a greater increase the next day, for a continual cycle of warmer water. Can I use on my indoor pool, spa or hot tub? 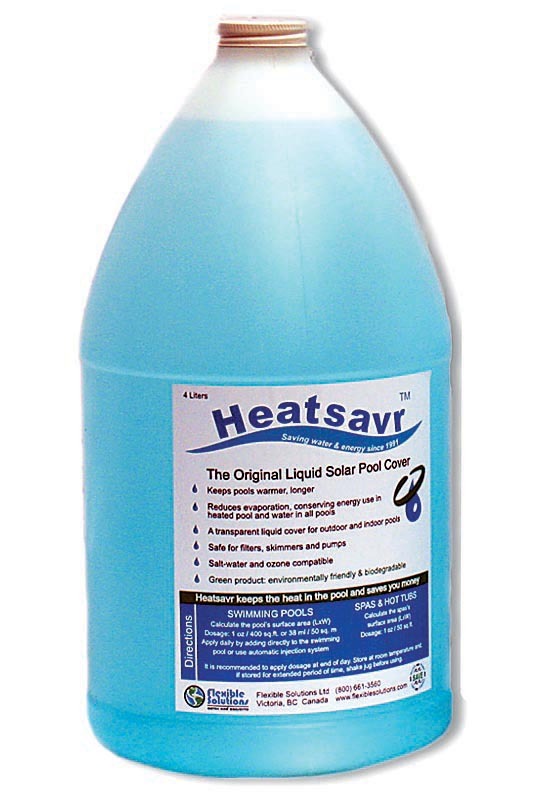 Yes, Heatsavr™ can be used on indoor pools, which lose heat and water to evaporation the same as outdoor pools do. Using Heatsavr™ on your indoor pool will save energy by lowering your heating requirements and the humidity levels in you pool room. If you are using a solid cover for your spa or hot tub we recommend you keep using it because of its excellent insulating qualities. However, Heatsavr™ can be used in conjunction with the solid cover or if there is no cover at all to conserve energy when the spa is open. The spa requires a higher dosage because of increased water temperature and higher bather loads. We recommend a dosage of 1 ounce/50 square feet of surface area each day. My Pool is really cold, can I still use? Heatsavr™ must be in pool water that is above 65-70 F in order for it to work properly. Will high winds affect Heatsavr's™ effectiveness? Yes, if a pool is not protected by a wind break and the winds are very high, Heatsavr™ can get pushed to one side of the pool and is not as effective. If winds are predictable a daily basis, schedule your application according to the time when the winds are reduced. If I add an extra Heatsavr™ will my pool heat faster? Unfortunately, the answer is no. Heatsavr™ uses the sun's heat to warm your water and keep that heat in the pool. The product on the water's surface biodegrades within 24 to 48 hours. That is why its patented slow-release mechanism allows the product to be distributed throughout a month's time. A 'super-dose' will not cause any harm, but it will be a waste of product and your money. I cut along the dotted line and put the Ecosavr™ in the pool but it didn't sink. What should I do? If the fish is still floating it is because there is an air bubble inside the fish. Take the fish out of the water and hold it upright. You should see an air bubble beneath the valve where the liquid should come out. Making sure the bubble stays directly below the valve, facing it away from your body slightly, carefully squeeze all the air out until you notice a small amount of liquid flowing. Place the fish back into your pool and watch it sink to the bottom. I had a difficult time squeezing the air out; should I cut lower along the line? The components of the liquid tend to start to solidify into a wax-like substance if the fish is stored or transported in cold temperatures. It is possible that the valve is slightly plugged. The easiest way to deal with this is to place the entire fish in a bath of hot tap water for 5 to 10 minutes. This will bring the product completely back into its liquid state and the air bubble should squeeze out easily. If you are still having problems, try cutting slightly below the dotted line, making sure to leave at least 1/4ÃÂ of fin. After a few days in my pool the liquid in my fish turned clear. Is it still working? Actually, when the liquid turns clear it is typically a sign that the Ecosavr™ is working properly. The natural blue dye added to the Heatsavr™ liquid inside the fish is sensitive to certain pool chemicals and sanitizers, and turns clear as the liquid starts to leave the fish. The change in color indicates that the flow has started and the Ecosavr™ is working well. I want to put my fish on a 'leash'; where should I punch a hole? You will notice that on every fish, surrounding the valve and below the dotted line there is an 'X' on one side and a square on the other. They are to indicate safe and convenient places to punch a hold to secure your leash.